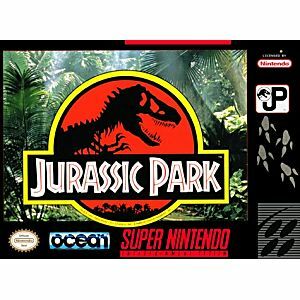 Jurassic Park SNES Super Nintendo Game Cartridge Cleaned Tested and Guaranteed to Work! If the movie shook you, Ocean's REAL 3-D graphics will blow you away! This is in-your-face, eyeball-to-eyeball, full-motion 3-D. We're going to put you closer to the main attractions than ever before possible. So close, that when you find yourself staring into the flared nostrils of a famished raptor, you can almost smell his breath. 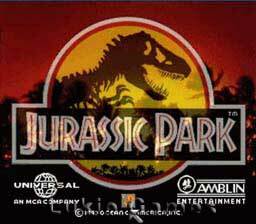 Play the greatest game of all time: Jurassic Park in 3-D Enjoy your stay! The only thing I don't like is not being able to save. Good shape, worked well, good price! This game was really fun to play. I played it years ago, but I just rented it and never beat the game. The only way to play it is a day and night until you beat it game. There is no way to save the game. I beat it yesterday evening. Thanks Lukie Games! 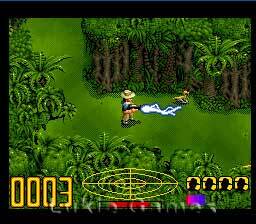 If you like Jurassic Park the movie then you'll love Jurassic Park the game. It'll have you glued to your seat and won't want to stop playing it. 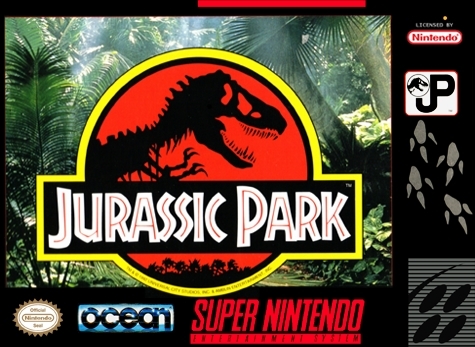 I enjoyed this game in my youth, but make sure you devote an entire day to it because there is no save feature. The graphics are good, the sound/music is also strong, and the gameplay has a good deal of variety with several weapons to switch through and a basic FPS mode when indoors.